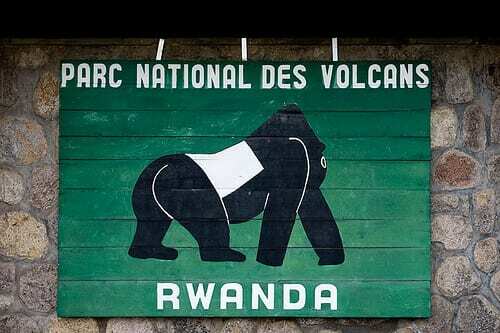 Parc National des Volcan takes in the Rwandan section of the Virunga chain of 5 volcanoes, and forms part of the border between Rwanda and Democratic Republic of Congo. The park is 160km square, starting at an elevation of 2,400m and reaching heights of 4,500m at the volcano peaks. The dense, cloud covered jungle starts abruptly after a drive and hike from the park HQ through terraced fields, and a quick hop over a 1.5m stone wall. Whilst the big draw is, of course, 7 of the last mountain gorilla families in the wild, the park also contains golden monkeys, buffalo bushbucks , duikers and bushpigs. $25 entry per day, plus permit fees dependent on your activity. Gorilla tracking costs $500 for a permit, which includes entrance. Golden monkey tracking is available for $100 including entrance fee, though very much plays second fiddle to the gorillas. Permits needs to be arranged in advance, though occasionally there may be a last minute opening on the day. There are also a range of guided hikes available, the 2 most popular being the 4 hour hike to Dianne Fossey’s grave ($80 including entrance fee), or the 2 day hike to the peak of Mount Karisimbi ($180 including entrance fee). The park is a 15 minute drive from the town of Musanze (formerly Ruhengeri), which is a good base with a selection of accommodations. There’s no public transport between Musanze and Parc National de Volcan, but plenty of taxis plying the route. There’s no accommodation or camping in the park itself, but there are a few high-end luxury lodges, as well as the more budget Kaniygi Guest House near the park entrance, or a decent choice of accommodation options a few kilometers away in Musanze.